What do you need to know about this release? Microsoft Stream is an enterprise video service that allows you to upload, share, manage and view videos. 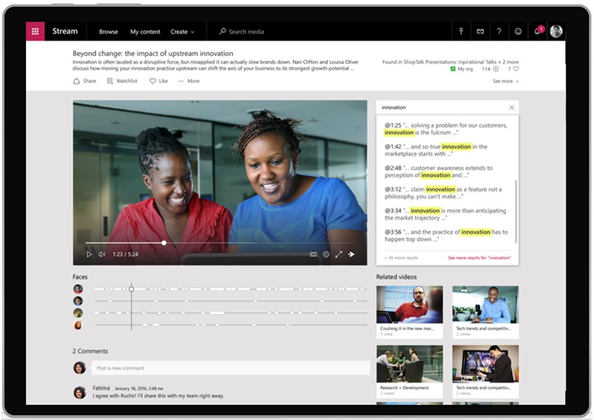 Microsoft Stream can become the location to search and discover all video content for your organization. Microsoft Stream can become a communication hub, training center, used to support business and drive better social communications. Create and organize content with channels and groups. Personal watch list of videos. Ability to upload, manage and share videos from a personalized home page. Like and comments on videos. Face timeline (using facial recognition) for better navigation of videos. Auto generated speech to text transcript; which help make videos more discoverable. Clickable time codes in comments section, transcript or table of contents allowing for easy video navigation. Ability to watch video across devices. Ability to manage permissions to videos. Ability to define metadata for classification of videos. Microsoft Stream is still highly integrated with the Office 365 service. It has deep integration with SharePoint Online, Microsoft Teams, Office 365 Groups and Yammer. Office 365 Video - Microsoft Stream is a replacement solution for the Office 365 Video service. Office 365 Video will still be around for a while so there is time to transition. Video Storage - Microsoft Stream uses pooled storage model for the entire tenant. Each tenant is allocated pooled storage and then additional pooled storage is provided based on the number of licensed users. The concept is identical to SharePoint Online storage. Each tenant is provided 500 GB of video storage plus an additional 500 MB of storage per user. If you need more storage, you can purchase more storage in 500 GB increments. Azure Media Services - Azure Media Services provides the power behind Microsoft Stream. You do not need to purchase any additional Azure Media Services. All you need to do is acquire Microsoft Stream. Microsoft Stream Plans - There are two plans for Microsoft Stream. The big different between Plan 1 and Plan 2, is Plan 2 includes: A) Deep search based speech to text metadata and B) Interact with video content using face detection and audio transcripts. Office 365 Plans - You can acquire Microsoft Stream in several ways as it is part of Office 365 plans or as a standalone service. If you have an Office 365 Suite (E1 or higher) you have access for Microsoft Stream. You also have the ability to purchase Microsoft Stream as an independent service. If you have an Office 365 E1 or E3 Suite, you will get the Microsoft Stream Plan 1. To get Microsoft Stream Plan 2, you have two options: purchase Microsoft Stream Plan 2 as an add-on or purchase Office 365 E5 suite.